In 2009, Thomas Slatin, a life long writer since the age of eight, and at the time a full time Emergency Medical Technician (EMT) and Firefighter, began to incorporate even more of a focus on photography into his life. He recalls much of his photography work “revolving around his work as an EMT and Firefighter, with a few exceptions.” Thomas Slatin continued, “a lot of the images I had taken at this point of my career were captured while I was at work,” or he would see something of interest that he wanted to photograph and would stop later to photograph various locations after his work day. It was also during 2009 that Slatin photographed the Eastern State Pentitentiary, the fiberglass whale model at The American Museum of Natural History, as well as abandoned freight trains and locomotives. His camera of choice remained as the Canon EOS Digital Rebel XSi. Slatin continued, “The Eastern State Pentitentiary was perhaps the only photography shoot from 2009 where I implemented a planning and pre-production process.” All of the photographs Slatin captured from his photography shoot at the Pentitentiary were taken in black and white. The majority of his photography sessions were impromptu, many completely by chance. “When an amazing photography moment presented itself, I quickly and eagerly captured the shots.” Thomas Slatin has been writer from young childhood to the point of adulthood and of course, still to this day. Slatin indicated that his interest and passion for photography which was kindled as a child, revealed itself again as a passion when he started designing websites in 1996. 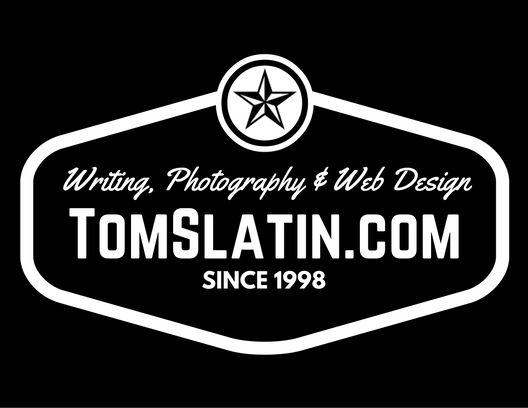 “My photography work started to take center stage during the last two decades, increasing each year.” It was in 1996 Thomas Slatin began incorporating his photography into his highly customized web sites that he designs for clients. Slatin’s favorite memory and one of his favorite photographs from 2009 includes his photograph of the 94 foot, 21,000 pound, blue fiberglass model of a female whale found at The American Museum of Natural History. The model is of a whale found in 1925. The beautiful female whale model to many symbolizes one’s responsibility to respect, appreciate and protect all sentient beings who reside in and out of the water, and utmost respect for the environment. “This trip meant a lot to me, as well as the photographs I took,” Slatin continued, “as a child I had been absolutely fascinated with this model whale exhibit, and seeing this as an adult was an indescribably amazing experience.” This was also the last trip Thomas Slatin had taken to New York with his late father, Dr. Harvey L. Slatin. “The image of this whale is very special to me,” Slatin concluded in a recent interview. The image may be found here. Another of his happiest photography moments of 2009 included photographing a collection of abandoned freight trains and locomotives. Slatin summarizing his first call from a collector, “it was about a month after I posted the pictures online, I received a phone call from a man who said he was a collector from Connecticut. He stated that he was inquiring about the location and owner of the railroad.” Slatin did his research to determine that the man was in fact a collector, and returned his call. According to Thomas Slatin, “very interesting things resulted later. One of the locomotives I photographed eventually was restored by a museum. It had a fence around it for sometime, but today it has since been moved as well as some of the other locomotives.” The big change in the evolution of Thomas Slatin’s photography in 2009 from prior years, “my style wasn’t so haphazard, I still had many impromptu shoots, yet I also started to apply more structure to my art of photography. For example, “to this day I seek permission when it’s necessary to photograph various locations and starting in 2009 and now, i have a regular time each day when I post photographs.” To view more of Thomas Slatin’s photography work, follow him on Twitter @twps and subscribe to his website, TomSlatin.com. Thomas Slatin updates his photographs each morning at 9 A.M. so that his audience knows the frequency of his postings. This is when his audience (social media followers) can view his additional photography work and blog updates, to include the writing work of Thomas Slatin.